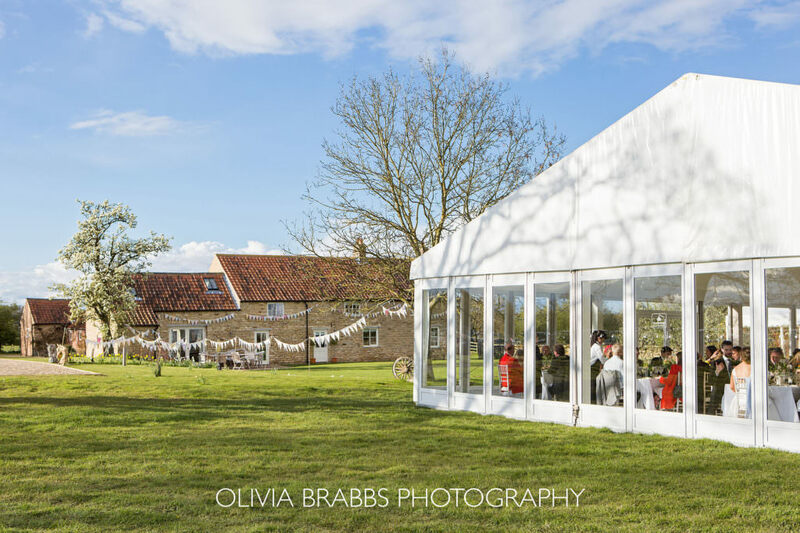 Chloe & Richard’s stunning Marquee Wedding at the end of April. Read about how they created their perfect day here (you may recognise some of the details from our ‘Day in the life of a Dine Events Manager’ feature). We are unbelievably satisfied customers of Dine – you were simply superb. I have not spoken to a single person who was at the wedding who didn’t mention how amazing the food was and how brilliant you all were. A couple of our guests run a lovely hotel and do a lot of weddings – they were completely raving about the staff, the canapés and the food in general – so it got the professional thumbs up too! Genuinely cannot thank you all enough. Total professionalism but with genuine friendliness. Perfect. Late in 2015, Chloe & Richard contacted Dine about catering for their forthcoming marquee wedding. They met Matt at The Mansion at the beginning of December to chat through a few ideas, and quickly established that we could deliver just what they wanted. A further planning meeting helped to create the schedule and perfect menu – the pair were also exceptionally organised, co-ordinating everything else with ease! Here we hand over to Chloe.. Date and location of wedding: 30th April 2016. Married at St Marys Church, Westow. Reception at our house. Drinks in the garden and then dinner and dancing in a beautiful marquee provided by Coopers in the field in front of our house. Part of the marquee, above the bar had a clear roof – and two sides of the marquee had glass doors. The proposal: Florence, Italy. In the gardens of the Four Seasons Hotel, after a lovely dinner in their beautiful restaurant. Richard had a ring and got down on one knee. He had even asked my dad. The dress: From Mirror, Mirror in London. By the French designers Cymbeline. The cake: Our cake was made by Birdgate Chocolatiers based in the little town of Pickering in North Yorkshire. They had made my sister’s cake five years before. They made us a bespoke chocolate cake. We gave them a copy of our invitation and they based the cake on that. There is a tree in our garden which is a real feature and we used it on our wedding invitations. The cake was a chocolate cake with white chocolate leaves around the edge. We are both keen horse riders, so we had solid chocolate models of our horses under a tree. They even got the colours of the horses right! The tree was two foot high and made of solid chocolate. Photography: Olivia Brabbs. She was brilliant, before the day coming round to have a look at the venue and chat about things. She was also wonderful on the day and has been fantastic help in designing the album. Honeymoon: I had qualified to compete at Badminton Horse Trials amateur championships so we set off the Monday after the wedding to spend a week down there. We hired a huge American Motor Home and loads of friends and family came and supported me. So the wedding party was extended! We are going on our ‘proper honeymoon’ in November to India. Flowers: My step-mother, Catriona Stewart did them. She is a local artist. She used olive trees and willow trees and my father and her have given them to us as a wedding gift. Hair: Emily Hawkes – an independent wedding hair stylist. Make-up: Louise Lunn – she did the make up for my sister’s wedding and happily was available for mine! She was brilliant as I was really concerned about it looking ‘natural’. Transport: We used Brooklands Vintage Cars to take the bride and bridesmaids to the church and the bridesmaids back to the reception. We were lucky enough to persuade David Hesketh from Burythorpe to provide a cart pulled by his beautiful shire mare Duchess to take us from the Church to the reception. He normally uses Duchess in ploughing displays and Land Army displays. She had never pulled a cart like ours before! Catering: Dine. Dine was simply superb. All of our guests commented on how amazing the food was. The food: A selection of, mini toad in the hole, handmade mini fishcakes, tart ‘tatin’, Yorkshire blue cheese straws, tomato and red pepper jam, shredded duck cones and Thai chicken satay were served to the guests during the drinks reception. For the wedding breakfast we chose an amuse bouche of celeriac and cauliflower velouté, with a cheese and tarragon beignet – served in a beautiful demitasse. 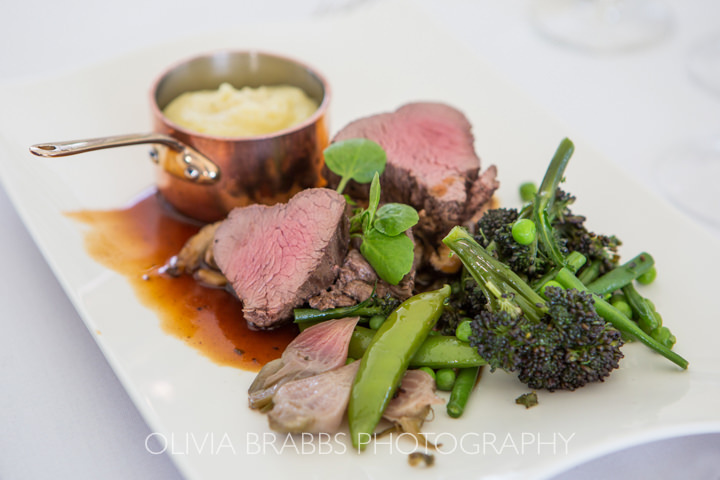 For main course fillet of beef was served with wild mushroom bourguignon confit, button onions, roasted beetroot and buttered greens, with a rich red wine sauce. Roast baby new potatoes and olive oil and black pepper mash. Dessert was sticky toffee pudding with honeycomb brittle and vanilla Anglaise. Entertainment: We had a trimmed down version (just 6 of them) of the York Railway Institute brass band during the drinks reception. The band for the evening reception were The Bush Doctors from Lincolnshire. They learnt a Rod Stewart song which was my Dad’s favourite for a dance with my Dad (and the groom to dance with his mum!) they were brilliant! Invitations, Order of ceremony and Table plan: All designed by JooseyBee designs who is based in York. She was amazing – really understood what we were looking for and came up with some fantastic designs for us which she adapted for each of the three things. The invitation was the tree with the horses underneath, the order of service incorporated the church and the table plan had our house as the background. If you are planning a marquee wedding and would like to chat to one of our team about how we can work with you to make your event special, do complete a contact form, email us on events@dine.co.uk or call us in the office on 0345 450 45 45.